"Graham Allison’s Destined for War makes his arguments through historical case studies that illuminate the pressure toward military confrontation when a rising power challenges a dominant one...[Allison's] wide-ranging, erudite case studies...span human history. " "A pertinent study of the relationship between the United States and China... A timely, reasoned treatise by a keen observer and historian." "In Destined for War, a brief but far-reaching book in which potted history is incisively deployed, Graham Allison explores how America and China may be on a collision course...One of the many strengths of Destined for War is the restoration of the late Samuel Huntington’s “Clash of Civilizations” theory, disparaged in the mid-1990s but subliminally gaining force by the day." "Before settling in for pleasurable summer books, read Graham Allison's Destined for War. A warning label: It's going to scare the hell out of you... [Allison is] a first-class academic with the instincts of a first-rate politician. He brings to the "Thucydides's Trap" an impressive sweep of history and geopolitical and military knowledge." "Allison's scholarship pulls historic examples forward vividly and efficiently, and as he gets closer to our time, he enriches the narrative with a detailed account of America's emergence at the beginning of the 20th century…Allison raises critical issues with a sense of both drama and history. His prose should alarm serious American thinkers." "The most comprehensive book to ever tackle the question of not only whether a US-China war is possible, but what steps Washington and Beijing can take to avoid such a calamity .... Allison’s efforts in Destined for War will surely be praised, and for good reasons .... Allison’s ideas flow easily, no matter how frightening they are .... We are finally about to have a real public debate about the very distinct possibility of a war between the US and China." "Allison’s book makes a fascinating and worthwhile contribution to our understanding of the nature of power as a function of the nation-state. Through his analysis of the four case studies in which war was avoided, Allison gives us “twelve clues for peace”, including practical examples of how Thucydides’s Trap was avoided. These include insights into the nature of leadership, how power is enacted, the opportunities and entrapments of alliances, and much more." "Mr Allison does not say that war between China and the United States is inevitable, but he thinks it “more likely than not”. This alarming conclusion is shared by many in Washington, where Mr Allison’s book is causing a stir...China and America could blunder into war in several ways, argues Mr Allison...With Donald Trump in the White House, Mr Allison worries that even a trade war might turn into a shooting war." Destined for War "tells the extraordinary story of China’s transformation since Deng abandoned Mao’s catastrophic Stalinism, and considers whether the story will end in war between China and America...New leaders must build institutions for global cooperation that can transcend Thucydides’ dynamics...I hope people like Jeff Bezos read this timely book and resolve to build the political forces we need." "Is China’s rise a threat to American interests? If so, how can America counter it? These questions form the background of Graham Allison’s essential book. The phrase 'Thucydides's Trap' is of Allison’s invention, coined to hammer home that the dilemmas America faces with China are not at all novel but actually formed the subject of the very first history ever written...In Allison’s hands, it becomes a paradigm case for understanding the dynamics of power transitions and how those transitions can lead to wars that leave both parties worse off than if they had come to terms." Thucydides's Trap selected as a Financial Times "word of the year"
"The thesis captured the attention of leaders in both Washington and Beijing. As early as 2013, I was present when China’s President Xi Jinping told a group of western visitors: 'We must all work together to avoid Thucydides’s trap.” But this year has seen much more public discussion of the idea.'" Destined for War selected as one of Bloomberg's "Best Books of 2018"
"This book has provided a useful lens through which to view the world. In the years ahead, I suspect CEOs and leaders of all stripes will return to its pages for insight into our increasingly complex era. I’m glad to have read it." "Today, with shifts in the balance of power, the risk of confrontation may increase. In assessing the Peloponnesian War in ancient Greece, Thucydides said, and I quote, “It was the rise of Athens and the fear that this instilled in Sparta that made war inevitable.” This is what the political scientist Graham Allison calls the “Thucydides Trap”. But in his book Destined for War and reviewing many examples of rivalry in the past, he concluded that conflict is never inevitable.Indeed, with leadership committed to strategic cooperation and to managing competing interests, we can avoid war and steer the world onto a safer path." "When talking about the so-called 'Thucydides Trap', when one great power tries to replace another, Ambassador Cui said that he doesn't think what happened in Europe's past will necessarily apply to the China-US relationship. "The best way of avoiding a trap is to open a new path and this is, I believe, a common task for our two countries and our shared responsibility to the world and to history," he said." "The lessons of history teach us that strong military might is important for a country to grow from being big to being strong ... A strong military is the way to avoid the ‘Thucydides Trap’ and escape the obsession that war is unavoidable between an emerging power and a ruling hegemony." "In an hour-long interview with Bloomberg on April 24, his first one-on-one with international media in more than three years, Najib spoke warmly of Malaysia’s relationship with both China and the U.S. He also stressed the need for the major powers to act in a "constructive” way in the region and avoid a potential Thucydides trap, named after the Greek historian who warned of war when an emerging power challenges a mature one." "Ray Dalio sees himself as a China expert, but for someone steeped in the country’s long history, he has changed his views very quickly…Mr. Dalio based his war fears on the Thucydides Trap, a historical concept ... which holds that wars are common between established and rising powers." "Graham Allison of Harvard is anxious in his Destined For War: conflict between the incumbent and rising power is almost inevitable." "A good primer on this is Graham Allison’s recent book, "Destined for War: Can America and China Avoid the Thucydides Trap?" Allison…makes the point that while we are playing checkers, the Chinese are not simply playing chess – they are playing a different game altogether: Go." "The goal, then, is to craft a sensible strategic approach that confronts China where we must, but cooperates where we can. It should be developed together by the Departments of Defense, State, Treasury and Homeland Security (for the cyber piece), and led by National Security Adviser H.R. McMaster. The working group should take input from outside experts and strategists including Allison." Can Semi-Capitalist China Supplant Semi-Socialist America? "Xi [Jinping] is the star of a recent “must read” book on geopolitics and America’s place—now and in the future—in the world. Destined for War: Can America and China Escape Thucydides’s Trap by Harvard University Professor Graham Allison (for many years, dean of Harvard’s Kennedy School of Government) confronts the compelling evidence that the Chinese economic juggernaut is rolling over America toward world supremacy. Military supremacy is driven by economic supremacy." "It isn’t often that a book comes along that should be mandatory reading for every member of Congress, Cabinet member and, for that matter, any senior governmental official with a connection to foreign policy and national security. But Graham Allison’s Destined for War: Can America and China Escape Thucydides’s Trap? is such a book." "Graham Allison says that avoiding the Thucydides Trap requires leaders to make good decisions. Exercising good judgment will be ever more critical if the US charts a more self-interested, some might say nationalist, foreign policy, at the same time that China increases its global engagement. To deal with these challenges and risks, both China and the US must find a way to surmount their mutual suspicions." "China’s resurging economic and military influence is reshaping the global balance of power. Allison assesses the hypotheses of an Athenian historian, Thucydides, that war is inevitable when a rising power challenges an existing power. By examining 16 case studies throughout history, 12 of which led to war, Allison sounds a warning about the rise of China. But he argues, war is not inevitable. As the Coast Guard operates around the globe as an agile military service with unique abilities and authorities, we must always consider the forces that shape our operating environment." "When a rising power challenges an incumbent one, war often follows. That prospect, known as Thucydides trap after the Greek historian who first described it, looms over relations between China and the West, particularly America. So, increasingly, does a more insidious confrontation. Even if China does not seek to conquer foreign lands, many people fear that it seeks to conquer foreign minds." "Allison, a Harvard professor, shows that -- more often than not -- a rising power has clashed with the established hegemon, and asks whether the US and China can escape this dismal pattern. 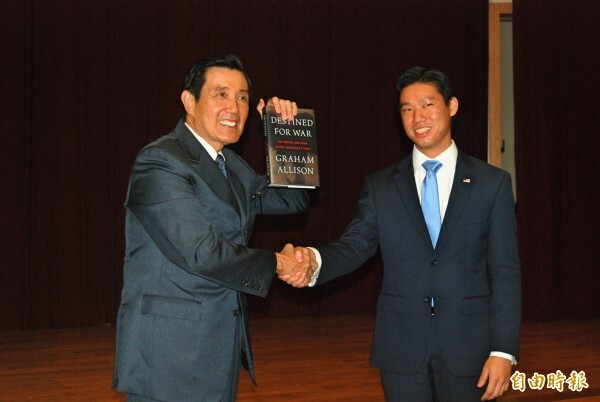 A book that has caught the attention of the leaders of both China and the US." "In The History of the Peloponnesian War, Thucydides noted that Sparta and Athens lived peacefully for decades, but the rise of Athens unsettled Sparta and the two states were drawn into battle. Taking the long view of the US/China rivalry, Allison identifies 16 similar struggles between great and emerging powers of which 12 ended in war. Though-provoking and very readable." "Allison offers erudite historical case studies that illuminate the pressure toward military confrontation when a rising power challenges a dominant one." "Dr. Graham Allison, author of Destined for War: Can America and China Escape Thucydides's Trap delivers a lecture to Special Operations Command personnel at the Joint Special Operations University on MacDill Air Force Base in Tampa, Fla., Nov. 9, 2017. The lecture provided an opportunity for the audience to learn about historic outcomes from rising world powers conflicting with ruling ones, such as the results of the Ancient Greek Peloponnesian War." "To avoid the so-called "Thucydides Trap" between the United States and China, [Chinese Vice Foreign Minister] He Yafei suggested, a "new security arrangement" based on the new concept of "common and cooperative security" rather than the one based on "the U.S.-centered military alliances" will have to "be put in place in Asia-Pacific, especially in East Asia, better sooner than later."" "China’s path toward becoming a world leader is not likely to be smooth sailing. In order to fulfill these ambitious targets, China has to overcome four traps: the Middle-Income Trap, the Tacitus Trap, the Thucydides Trap, and the Kindleberger Trap." Can we avoid the 'Thucydides Trap'? "When an emerging power attempts to supplant a hegemonic power in international politics, major conflict often ensues. Harvard professor Graham T. Allison describes this scenario as the “Thucydides Trap.” His recent book on the subject —Destined for War: Can America and China Escape Thucydides’s Trap? — has received worldwide attention." "The only thing we're debating is rational accomodationists that say let's stay out of this Thucydides Trap (as China grows, it's always going to be bigger but we can be rational and kind of drive this growth to a better place and stay a good second power) are hawks like myself that say they want to be hegemonic." Politico "asked the most interesting people we know to tell us what they’re reading this summer," and Evelyn Farkas, former deputy assistant secretary of defense for Russia, Ukraine, Eurasia, lists Destined for War, which she calls "Probably the one recent book you need to read to wrap your head around our current dynamic with China." Is the US headed for a showdown with North Korea? "Since the election of Donald Trump, the probability of a Sino-American conflict has soared...the biggest flashpoint is without question North Korea — which brings me back to Thucydides and Graham Allison’s “Destined for War,” this summer’s must-read book in both Washington and Beijing." "Insofar as Graham Allison is exhorting the United States and China to avoid gratuitous strategic errors, his advice, I would suggest, is soundly Thucydidean. Decision-makers in both countries would do well to heed him. For what is lost by caution — or, to use a favored Greek term, moderation — and a corresponding aliveness to the danger of clashing interests in the shadow of broader shifts in the balance of power? In great power politics, an ounce of prevention is surely worth a pound of cure, for if the plague to be cured is war, the disease has already progressed too far." Graham Allison and Anne Gearan of The Washington Post join guest host Jeff Glor for a discussion of North Korea's new intercontinental ballistic missile test. In an interview with VOA, Graham Allison says the notion that China "just wants to be another responsible stakeholder, maintaining the order we are part of," is wishful thinking. "China wants to be predominant in Asia, as Teddy Roosevelt wanted to be in our hemisphere," said Allison, referring to the U.S. president who proclaimed in 1904 that the United States had an exclusive right to settle international disputes in the Western Hemisphere. Graham Allison on "Office Hours"
In the newest episode of "Office Hours," Graham Allison talks with Aroop Mukharji about his new book Destined for War. Allison explains the big idea that is Thucydides’s Trap, what might spark war between America and China, and what he has in common with Queen Elizabeth II. Let’s imagine a Chinese “applied history” project, similar to the one at Harvard’s Belfer Center that helped spawn Professor Graham Allison’s widely discussed book Destined for War. Allison’s historical analysis led him to posit a “Thucydides Trap” and the danger (if not inevitability) of war between a rising China and a dominant America, like the ancient conflict between Athens and Sparta chronicled described by the Greek historian Thucydides. A study by the Belfer Center’s Applied History Project identified 16 similar “rising versus ruling” cases over the past 500 years, 12 of which resulted in war. What would the Chinese say about the lessons of past interactions with the West? As China continues to expand its economic and international influence, this lack of cross-cultural understanding could have tragic consequences. Harvard Professor Graham Allison has articulated an idea known as the "Thucydides Trap." It states that, through history, the rise of an emerging power very often creates fear and anxiety among established powers, which can (in the worst-case scenario) lead to war. Schwarzman Scholars was designed to help defuse those tensions and create a more peaceful world. Harvard University professor Graham Allison had a question for me when I chatted with him last week about his new book: Destined for War: Can America and China Escape Thucydides's Trap? He found that some Chinese are uncomfortable with the word "inevitable" in his description of the Thucydides's Trap. "They say 'war is not inevitable'. I say, 'Correct, correct, it's not inevitable'," says Allison. The Trump White House isn’t known as a hot spot for Ivy League intellectuals. But last month, a Harvard academic slipped into the White House complex for an unusual meeting. Graham Allison, an avuncular foreign policy thinker who served under Reagan and Clinton, was paying a visit to the Trump National Security Council, where he briefed a group of staffers on one of history’s most studied conflicts—a brutal war waged nearly 2,500 years ago, one whose lessons still resonate, even in the administration of a president who doesn’t like to read. What Are the Odds of a U.S.-China War? Are the U.S. and China headed for war? That has been the recent hot question in China circles, spurred by a deluge of books that handicap the chances. Graham Allison, the Harvard professor who popularized the term “Thucydides's Trap” to describe the risk of conflict when a rising power challenges the incumbent, isn’t optimistic. Foreign Policy Book Talk: Are the United States and China Destined for War? With history as a guide, Graham Allison joins FP's signature podcast to look at China’s chest-thumping at home and in the South China Sea, and how this new expansionism threatens the United States. Neither country wants hostilities, but what are the flashpoints that could lead to conflict? Could China’s geopolitical leverage defang North Korea? Or could Pyongyang set China and the United States on a course for war? It’s no secret that Xi Jinping isn’t a fan of Kim Jong Un’s regime, but could Donald Trump’s loud mouth lead to missile launches? Or is there a road to peace and stability? Interview on CBC's "The Current"
In an interview on "The Current," Canada's most listened-to radio program, host Anna Maria Tremonti spoke to Graham Allison about possible routes to a Sino-American war. "In these [war] games which have been played over and over, even though people know they don't want to get to the end of the game in which Americans and Chinese are killing each other, the process turns out to be a lot easier than you would suspect," Allison told Tremonti. Jake Sullivan's 2017 "Owen Harries Lecture"
In a lecture delivered to the Lowy Institute in Sydney, Australia, Jake Sullivan noted: "The great Harvard political scientist Graham Allison just came out with a book called Thucydides’s Trap. Thucydides first observed, millennia ago, that it was the rise of Athens, and the anxiety it caused Sparta, that led to the Peloponnesian War. Allison studied the last 16 cases where an established power had to deal with a rising power. 12 of those cases resulted in war. So without careful management, there are a lot of structural forces pulling the two countries toward confrontation." On The Katie Couric Podcast, Graham Allison delves into the challenges associated with China's rising power, the diplomatic implications of the Paris Climate Accord, and why the US seems caught in a slow-motion Cuban Missile Crisis with North Korea. The ultimate risk is of a future conflict between the U.S. and China, the “Thucydides's Trap” that Australian PM Malcolm Turnbull raised in his speech, in a reference to the tendency of ruling and rising powers to end up at war. When Graham Allison -- the Harvard professor who coined the term -- finished writing his book “Destined for War: Can America and China Escape Thucydides’s Trap?” Trump had yet to be elected president, Allison said in a phone interview from Washington. The book was published Wednesday. As a result, the U.S. had yet to raise the stakes with North Korea, or warned the leadership in Beijing that the only way to avoid a U.S. military build-up in the region was for China to solve the peninsula’s nuclear problem. North Korea is one of several potential triggers for an eventual, unintended China-U.S. conflict that Allison lays out in his book. Interview on On Point: "Are We Headed For War With China?" Is China a bigger danger to the US than ISIS or Russia? Graham Allison, in conversation with On Point's Sascha Pfeiffer and The Economist's David Rennie, argues that a catastrophic clash between the US and China is much more likely than most Americans realize. A US-China war is not inevitable, Allison says, but they will have to work hard to avoid one. Interview on The Leonard Lopate Show: "What Ancient Greece Tells Us About China Relations"
Graham Allison joins WNYC's Leonard Lopate to discuss Destined for War and detail which parallels in history best explain the relationship between the US and China. Interview on "The Hugh Hewitt Show"
Hugh Hewitt interviews Graham Allison about his new book, "ominous signals on the Korean Peninsula," and US foreign policy towards China. Speaking to All Things Considered host Robert Siegel on Memorial Day, Graham Allison discusses honoring the fallen by avoiding unnecessary wars. With rising tensions between the US and China, The Cipher Brief’s CEO and Publisher Suzanne Kelly speaks with Graham Allison, about his new book and US-China relations. Interview with Macleans: "Is war between America and China inevitable?" In an interview with Canadian current affairs magazine Macleans, Graham Allison talks Thucydides's Trap, Teddy Roosevelt, and the temptation for established powers to strike rising powers before it’s too late. Eurasia Group president and best-selling author Ian Bremmer sits down with Graham Allison to talk about Destined for War. "I can't think of a book I have read in recent times that I think more needed to be written than this one," said Bremmer. US Senator Dan Sullivan: Allison's book Destined for War is "a must read"
In a speech on the floor of the US Senate, Sen. Sullivan discussed "the most significant long-term challenge we face as a country: the rise of China and the threat it poses to the post-World War II international order." Sullivan continued: "I have had the privilege over the last few weeks to review [Allison's] book, and I believe it will be a 'must read' for those who care about the long-term security and economic interests of the United States." NPR national security correspondent Greg Myre profiles Thucydides's Trap on "Morning Edition," reporting that "history is littered with examples of countries stumbling into unwanted wars that quickly spiral out of control." During a conversation with the Harvard Association for Law and Business (HALB), Stephen A. Schwarzman, chairman, CEO and co-founder of the Blackstone Group — the largest alternative asset management firm in the world — cited the Thucydides's Trap as a motivating factor for creating the Schwarzman Scholars program. “If the scholars developed into thought leaders, they would become a layer of protection against this Thucydides's Trap,” Schwarzman noted. “You could easily end up with a civil war on the inside,” Graham Allison, a professor at Harvard’s John F. Kennedy School of Government, said in a Thursday talk at at the Center for the National Interest to discuss US-China war scenarios from Destined for War. “We’ll take our side and the Chinese will take their side, and that’s a scenario where the two could start fighting.” Allison added that a military official in the region had told him Kim’s overthrow or demise would touch off a “vertical track meet” between U.S. and Chinese forces racing to secure the country’s nuclear weapons. "Disorder under heaven," an Economist special report on China, features "a much-discussed recent study led by Graham Allison of Harvard university highlighted the dangers looming when a rising power challenges a ruling one, as when Athens challenged Sparta in ancient Greece." As Graham Allison notes, it is imperative for the United States and China to avoid an unpremeditated war. The emerging strategic relationship between China and the United States has all the characteristics of the “Thucydides's Trap,” in which a rising power challenges the dominance of a status-quo power. Indeed, Allison’s historical research indicates that more often than not it leads to war, an outcome that is far from being in the interest of either power. "As the former U.S. Ambassador to the United Nations, Samantha Power has seen a lot. So when she calls a book “gasp-worthy,” we should pay attention...For Ambassador Power, the most chilling part of Allison’s book was its final chapter, which examines the domestic politics of both countries. Allison is specifically concerned with how American politics will respond to this change. As the Trump Administration threatens to step out of certain world affairs like climate change, it creates room for China to come in and become the leader." Is China challenging the United States for global leadership? "As Donald Trump prepares to welcome Xi Jinping next week for the two men’s first face-to-face encounter, both countries are reassessing their place in the world ... At the UN in Geneva, Xi talked about a “hegemon imposing its will on others” andwarned America about a “Thucydides trap”—the disaster that befell ancient Greece when the incumbent power, Sparta, failed to accommodate the rising one, Athens." In a commentary published by China's official Xinhua news agency, Zhu Junqing warns about the danger presented by Thucydides's Trap whiledescribing how the April 6-7 summit between Trump and Xi creates "great opportunities" after the "twists and turns over the past months" in US-China relations. Are We on the Verge of a Full-On Trade War With China? David Rothkopf, Rosa Brooks, and Colin Kahl take on the big questions of Secretary of State Rex Tillerson’s trip to Asia. China was once a cheerleader for Trump, but that could quickly change now that the president is singing a different tune. Rothkopf shares his takeaways from a recent conversation with Destined for War author Graham Allison (8:50), including a revelation about what White House chief strategist Steve Bannon thinks about Thucydides's Trap. Xi Jinping: "Work Together to Build a Community of Shared Future for Mankind"
"Countries should foster partnerships based on dialogue, non-confrontation and non-alliance. Major powers should respect each other’s core interests and major concerns, keep their differences under control and build a new model of relations featuring non-conflict, non-confrontation, mutual respect and win-win cooperation. As long as we maintain communication and treat each other with sincerity, the “Thucydides Trap” can be avoided. Big countries should treat smaller ones as equals instead of acting as a hegemon imposing their will on others."